If it’s an essential tool, chances are good that it’s in the Stanley 65-Piece Homeowner’s Tool Kit, reviewers say. The kit contains a hammer, measuring tape, utility knife, level, two sets of pliers, a standard and Phillips screwdriver, two sets of hex keys, a ¼-inch round-head ratchet, eight ¼-inch sockets, a ¼-inch spinner handle, a ¼-inch bit handle, and 30 bits. Owners say the Stanley kit has just about everything they need, though some grouse that it doesn’t include an adjustable wrench. However, those who want a wrench have the option to purchase it along with this kit; a more comprehensive screwdriver set is also available. The tools all fit in the accompanying blow-molded plastic case, though some users say they don’t stay put as tightly as they like. However, the vast majority of buyers say the tools themselves are good quality for those who only need them for occasional household use. A great set for anyone who needs easy access to the bare essentials, the WORKPRO 100-Piece Kitchen Drawer Tool Kit packs a lot of utility into a small package. 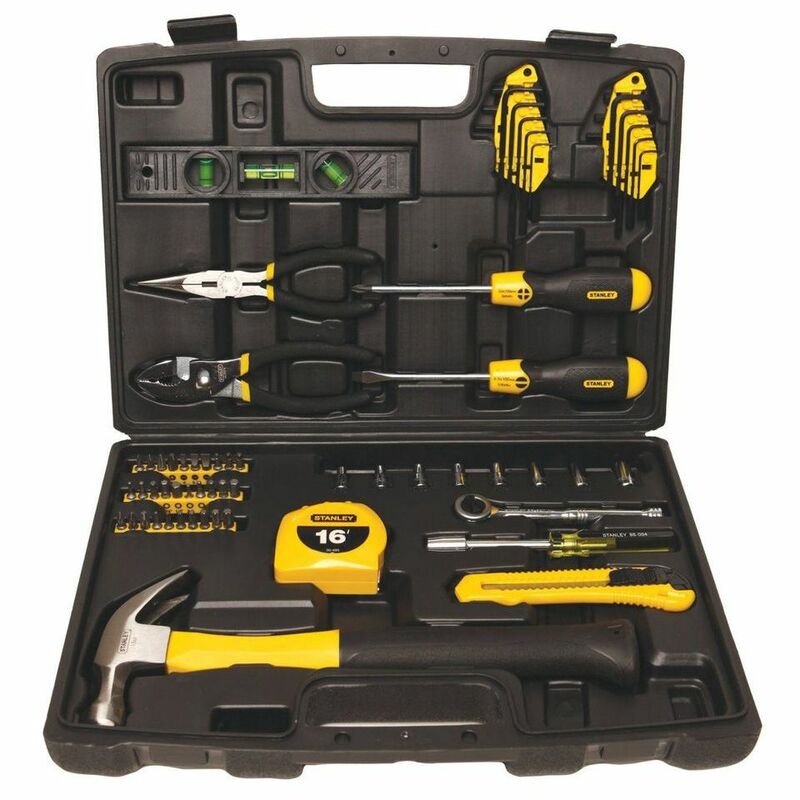 The kit includes a hammer, two pairs of pliers, a utility knife, a level, an adjustable wrench, a tape measure, a precision screwdriver, a bit holder, nine sockets, 19 specialty bits, and a set of hex keys. Reviewers are impressed with the quality of the included tools, especially for the price. They also like the zippered case that holds this kit, which includes straps to keep everything neat and is small enough to fit in a kitchen drawer, as the kit’s name suggests. However, they note that the hex-key selection is limited and there are no wide-jaw pliers, two limitations that might frustrate some. Some also note that the selection is a bit limited and say the tools aren’t suitable for heavy duty use, but they agree the kit is perfect for occasional, limited applications. Some buyers may be willing to spend a little more to ensure their tool kit doesn’t leave them hanging. The WORKPRO 322-Piece Tool Kit with Carry Bag covers all its bases with a staggering number of tools, reviewers say. It includes a large socket set, three pairs of pliers, six full-size screwdrivers and seven precision screwdrivers, a level, a hammer, a utility knife, a tape measure, a folding hex key, an adjustable wrench, scissors, brush, insulated tape, cable ties, and more. One feature many owners rave about is that the WORKPRO kit comes with a nylon bag that has convenient exterior pockets and a shoulder strap. They like being able to toss tools into a bag instead of finding their proper slots in a plastic case, as is required by many tool kits. Of course, the downside of having so many tools is weight—the kit weighs in just shy of 25 pounds, reviewers caution. The tools themselves are made of heat-treated chrome vanadium steel, and owners say they are sturdy and high quality for the price. The Black and Decker 20-Volt MAX Lithium Ion Drill and Project Kit has a number of handy must-haves for homeowners, as well as one big bonus over most other ready-made kits: a 20-volt, rechargeable power drill. Tools include a hammer, two screwdrivers, two sets of pliers, an adjustable wrench, a utility knife, a ratcheting screwdriver and 32 bits, four nut drivers, a magnetic bit tip holder, 10 general drill bits, five spade bits, four hole saws and a mandrel. The kit can also be purchased with a 109-piece drill bit and screwdriver bit set. Owners love having a power drill in their kit, and they say it’s powerful enough for most common household jobs, though some say it’s not powerful enough for heavy-duty use. The drill has an 11-position clutch to help guard against stripping screws, helpful for users who don’t have much power-tool experience. While most reviewers say the tools are fine for light household use, some question the quality, saying they’re a bit flimsy. They also wish the accompanying bag had some internal compartments or dividers to help keep everything organized. For a first apartment or even a dorm room, this tool set is a great choice—especially if you just need the basics. The 39-piece set includes a 12-foot tape measure, a claw hammer, 6-inch slip joint pliers, eight hex keys, a ratcheting bit driver, 8-inch scissors, 20 bits, a utility knife, and four screw drivers. And it all comes in a plastic case to keep things organized. While the tools aren't as strong as the ones in our best overall pick, they will be sufficient for occasional repairs or home improvement tasks. Reviewers have noted that they do the job, but that you get what you are paying for with a budget tool kit. Of course the kit does come with a limited lifetime warranty in case anything breaks. Mechanics have different needs than buyers who won’t be spending much time tinkering in the garage, and the Crescent CTK170CMP2 Mechanics Tool Set does a good job addressing those needs, reviewers say. The kit has 170 pieces including three sizes of quick-release ratchets, a wide variety of sockets, a dozen combination wrenches, an adjustable wrench, two sets of pliers, four screwdrivers, a magnetic bit driver and 44 bits, and more than two dozen hex keys. Reviewers say the plastic blow-molded case on the Crescent set is sturdy, and they like the convenient folding door that opens from the center, allowing easy access to all the tools or just one side. However, some point out that tools don’t always stay put in their slots. But they are complimentary of the heat-treated chrome vanadium steel tools, which they say are have a high-quality look and feel. Who says your toolkit has to be basic black? Fans of pink will flock to this comprehensive kit that is great for the average DIYer with its basic tools the average person needs like a hammer, tape measure, level wrench and more. What's the more the set is compact and lightweight making it easy to store and pull out when needed. A great gift for any woman or perhaps a perfect housewarming gift, this tool set has 87% five-star reviews with customers saying it has everything you need and a great gift for everyone on their list. We bought and tested a top-rated home tool kit. Our reviewers spent 10 hours using the tools to finish DIY projects around their homes. We asked our testers to consider the most important features when using this home tool kit, from how easy it was to use to how much space it takes up. We've outlined the key points here so that you, too, know what to look for when shopping. Experience level Some tool kits are better suited for more experienced users. If you’re a beginner, you’re probably better off with a basic kit that has easy-to-use tools. However, if you have more experience working around the house, you might be looking for more advanced tools to supplement your existing arsenal. Intended projects Is there a particular task you need to complete with your tool kit? For example, if you’re hanging a painting, you’ll probably need a measuring tape, level, screwdriver or hammer, and maybe even a stud finder. Think about what you’ll be using your tools for as you hunt for the perfect home kit. 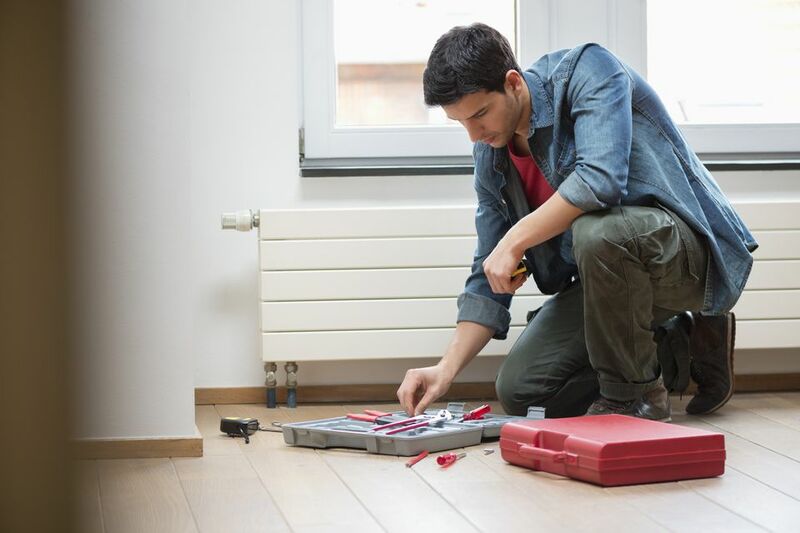 Storage space Even though it's not the most important factor to consider when buying a tool kit, you should think about how much space it will take up in your home. If you’re living in a small apartment, a complex product with several hundred pieces will take up a solid chunk of your storage space. On the other hand, if you have a whole garage to dedicate to your tools, you have plenty of room to store a comprehensive kit. “I think this is a great tool set for a new homeowner, someone who is not that handy, someone who owns an apartment, or maybe a kid going off to a college,” one of our testers recommended. The kit’s best features, according to our reviewers, were the portable hard case and large selection of tools. One of our testers, who used the tool kit to hang pictures and assemble and disassemble some furniture, described the tools as “durable” and “quality made for the amount of money.” While our reviewers liked that the kit kept everything organized, one mentioned some of the tools fell out of place even after being snapped in.